Parts of the UK could be battered by more strong winds and torrential downpours on Tuesday. Gusts of up to 75mph are forecast for much of the country, with the strongest winds expected during the evening. 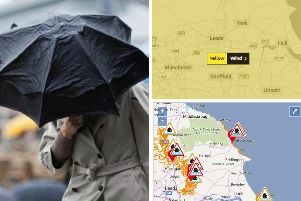 The Met Office has issued a yellow weather warning for the north of England down to the Midlands, as well as Scotland, Northern Ireland and Wales, which is in place from 8pm until 10am on Wednesday. Road, rail and air services may be affected with longer journey times and cancellations possible, along with some restriction to roads and bridges. There is a also small chance of power cuts, and some damage to buildings such as tiles blowing off roofs, the Met Office said. Forecasters say the gales will be coupled with heavy rain, causing hazardous driving conditions. A predicted 1.5 inches (3.8cm) is forecast to fall in up to nine hours in Scotland and Northern Ireland, which could cause flooding. Forecasters say homes and businesses in these areas could also be affected.